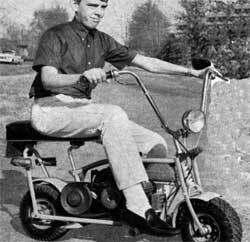 The traditional mini bike was such a common sight in the 1950's that it's surprising so few people have them today. But wait! You can buy a pocket bike at all the stores, you might say. Sure, you could. And it's made in China, covered in plastic, and who knows about getting parts for it down the road. Nope, it's the traditional styled mini bike that is the king of two-wheeled on/off road vehicles. Unfortunately due to the growth of cities, in most places these aren't legal to ride on the street. Check your local laws. They probably weren't legal then, either, but no one in their right mind would get between a kid and some good, clean fun. How times change. These bike plans will show you how to modify a junked bicycle frame to become the base of the mini bike frame. It's an ingenious thought, though you might want to start from scratch to ensure a solid frame. 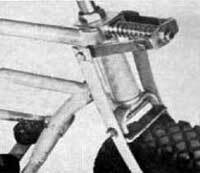 The front end has a unique feature, which is a springer-like fork (see below). It doesn't push up and down, per se, but does rock forward to cushion your ride a bit. And unlike our other mini bike plans, this one shows a torque convertor installed. This is a big improvement in performance over the others, and will allow a much better top speed, and much better hill climbing power.